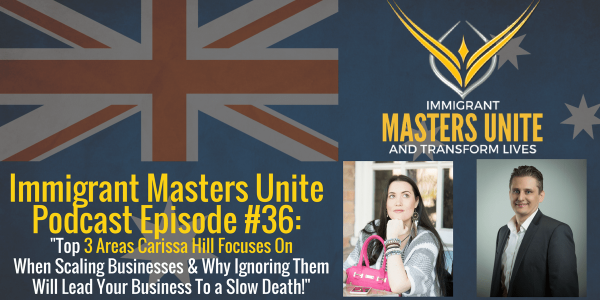 IMU 036: Top 3 Areas Carissa Hill Focuses On When Scaling Businesses & Why Ignoring Them Will Lead a Business To a Slow Death! | Immigrant Masters Unite Podcast: Transform Your Business, Life and The World Around You! What if I told you that in order to succeed in business, in order to scale your business to 6,7 figures, you have to focus on 3 primary areas of your business? And what if I told you that anybody can do this, anyone can build a successful business? And what if I told you that a small town girl, in a town where to this day, there’s no internet, has been able to build very successful business and help many other business owners do the same? Would you listen to see what she has to say? I know I would! Hey, this is Polish Peter and welcome to episode 36 of Immigrant Masters Unite, where Immigrants Unite and Transform Lives. Today, I have Carissa Hill who is a serial entrepreneur, author, international speaker and business coach specializing in helping women business owners scale and grow their businesses to six figures and beyond. In her book, “Grow Your Business With Facebook,” Carissa shares the story of how she used Facebook to quickly grow her businesses and then systematize and set them up to run without her personally doing the work. Carissa is originally from Australia and lives with her husband Travis and their newborn baby Jayden. Her story of how she was able to build a successful hair salon from scratch and why you don’t need thousands of dollars, office space, tons of equipment or people to start a successful business. Top 3 things you need to focus on when it comes to building and scaling your business and why your business will die a slow death if you don’t focus on those 3 areas of your business. Simple 5 minute exercise Carissa uses when she is being stopped by fear. In fact, Carissa was afraid to get on camera and be in front of people on the internet and this one exercise has allowed her to get on the camera and do it, despite having that fear. Now, she has a following of thousands of people on Youtube, Facebook and Instagram.